Friday Five: Good Neighborhood Eats in L.A.
Chego: Cheap, delicious rice bowls from the man who brought you the Kogi truck. Don’t miss the Ooey Gooey Fries and Sriracha Candybar. Versailles: Really good Cuban food. As a vegetarian, I love the simple goodness of their rice, black beans and fried plantains. 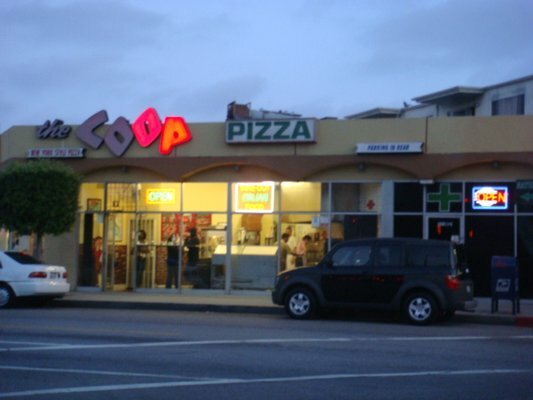 The Coop: The closest approximation of New York-style pizza I’ve had in L.A. Their tiny storefront near a freeway overpass is always hopping with locals getting their pizza fix. Scoops Westside: Small batches of unique ice cream flavors made fresh daily. You can’t really go wrong with any of the flavors, but some of my personal faves are Cinnamon Cheddar, Coconut Cardamom, Hazelnut Banana and Chai Tea. Del Taco/In-N-Out: Fast food drive-thru fare can really hit the spot sometimes, and when I’m craving this type of decadence, Palms’ Del Taco and In-N-Out are my go-to choices. Both are West Coast chains, so there’s a built-in novelty factor for out-of-towners. In-N-Out’s quality ingredients and secret menu (grilled cheese!) make it great, and Del Taco offers Mexican food that’s FAR superior to Taco Bell. Photo via Yelp user Winnie L.